SINGAPORE (Feb 20): The Philippine peso tumbled to its lowest level in more than a decade on Monday, with its slide picking up further momentum after it breached psychological support at 50 per US dollar. The head of the Philippine central bank said the peso's weakness was driven by risk-off sentiment and geopolitical concerns, especially in Europe. The governor of the Philippine central bank, Amando Tetangco, said the central bank does not target a specific exchange rate level but is mindful of excessive volatility. The peso slipped to as low as 50.20 per US dollar as of 0547 GMT, matching a trough last touched in November 2006. 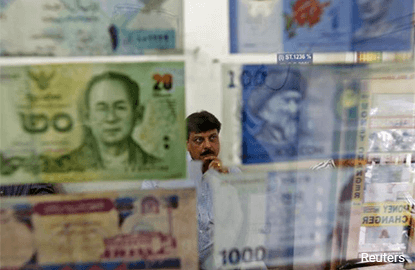 The level of 50.00 per US dollar had previously been a key threshold, since the peso had held that level "partly because of official intervention" said Andy Ji, Asian currency strategist for Commonwealth Bank of Australia. "I think the market's been shaken a little bit," Ji said, referring to the peso's fall on Monday. The peso's drop below the key technical support level appears to have caught some market participants off guard, and is a bearish signal for the peso, he added. Separately, analysts at Maybank said in a research note that there was some market chatter of selling in 10-year Philippine bonds. The peso had set an eight-year low of 50.00 against the greenback late last November. That came as the US dollar rallied after the US presidential elections, buoyed by expectations that Donald Trump's fiscal policy proposals would bolster growth and inflation and prompt the Federal Reserve to raise interest rates at a faster pace. While the peso tested that trough on a number of occasions since then, it had managed to avoid falling beyond that level until Monday. The drop in the peso came on a day when several other emerging Asian currencies were lower against the US dollar, with the Indonesian rupiah slipping 0.2% and the Malaysian ringgit easing 0.1%. Markets, already nervous over the possibility of a win for far-right, anti-European Union candidate Marine Le Pen, were jolted after two French hard-left candidates late on Friday said they were discussing cooperation in their bid for the country's presidency. The fear in markets is that a unified left-wing front could cause the centrist vote to shift towards Le Pen.